​The 2017 Ohio abortion rate was 8.9 per 1,000 resident women ages 15-44 years old; unchanged from the rate in 2016 . 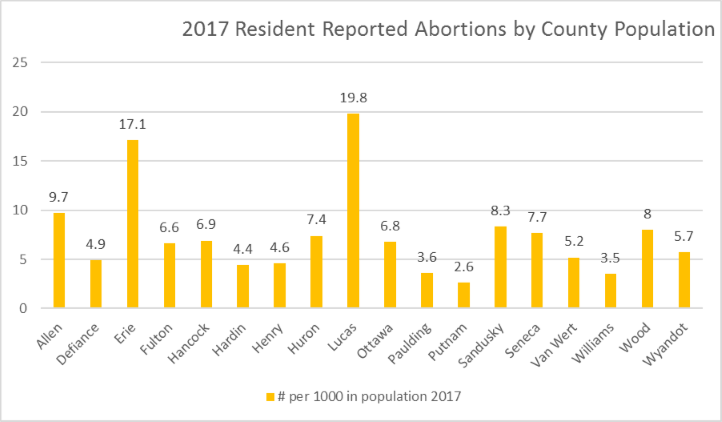 The 2017 Ohio resident abortion ratio was 144 abortions per 1,000 live births; slightly increased from the ratio in 2016. ​More than half of all induced abortions involved pregnancies of less than nine weeks (56%), with approximately 29% involving pregnancies of nine to 12 weeks (Table 2). The proportion involving abortions of less than nine weeks increased from 49% in 1997, while the proportion between nine and 12 weeks declined from 35% to 29% (Figure 7). There were 454 abortions in 2017 involving pregnancies of 19 or more completed weeks of gestation (Table 2). That represents a decrease from the 508 reported in 2016.